I need to set the font on the XP command prompt on a few machines so that it would correctly display Hebrew file names. The default font displays a lot of gibberish, so I'm pretty sure changing it will do the trick. Can anyone point me in the right direction? You need to create a new string value, called 00, with a value of the name of the font you want to use. If you already have a 00 entry in their, use 000 and so on. Once done, restart the machine. You should now be able to click on the upper left corner and your font list should now include the font you wish to use. Apart from installing a font with Hebrew glyphs, I think you may also need to change the codepage, like by invoking chcp 65001 (65001 being CP_UTF8). The console rendering model assumes each character fits neatly inside its fixed-sized cell. When a new character is written to a cell, the old cell is overprinted with the new character, but if the old character has overhang or underhang, those extra pixels are left behind since they "spilled over" the required cell and infected neighbor cells. Similarly, if a neighboring character "spilled over", those "spillover pixels" would get erased. 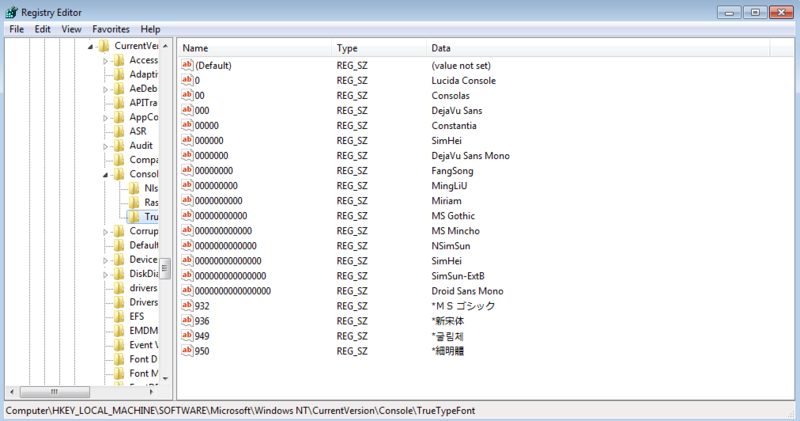 In other words: only a few fonts will actually render nicely in console windows. In the command-prompt you can click on the upper-left corner icon to choose Properties. In those screens is a Font choice but on my system it is limited to 2 fonts. Not the answer you're looking for? Browse other questions tagged windows-xp command-line-interface font or ask your own question. How to get coloured file listing in windows cmd shell? How to delete file with option character in name in Linux?